What Rocky Mountain scene would be complete without these raucous black and white birds? They are scavengers, much like the Camp Robber. If you camp out you will definitely hear these squawkers! 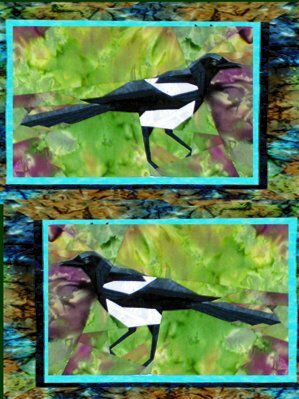 A relatively simple pattern - it will add a dash of humor to your wildlife quilt. This fabric kit includes a pattern.